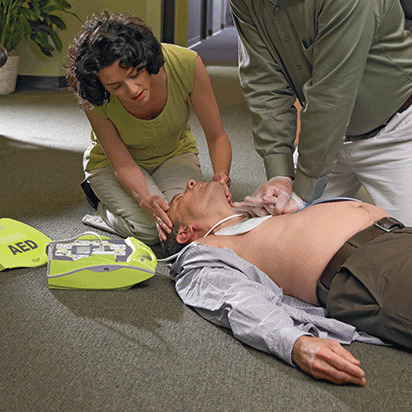 Adult First Aid/CPR/AED Online is rated 4.3 out of 5 by 510. Rated 5 out of 5 by KathrynB from CPR This was a very informative and interactive training. I enjoyed it and especially loved that i could do this in segments. Rated 5 out of 5 by sbsondrol from Good fit It was exactly what I wanted. It was great that I could do the course on my own time. Rated 5 out of 5 by Mbsunny from CPR I bought this on line course to renew my CPR certification and I’m so glad I chose this class! Rated 4 out of 5 by jude 123 from Convenient Easy enough to get through the class but getting the certificate proved to be a little more difficult. Rated 4 out of 5 by Ctaylor from So Glad to have this cert available online! I felt these courses covered the information presented in the typical CPR/AED/First Aid classes that I've had numerous times. The program worked well and took about 2 hours. My only issue was that I was using a laptop without a mouse and the hand placements for all 3 techniques (CPR, Chin tilt & Choking victim) where hard to place. Rated 5 out of 5 by SummitManager from Great Content! I enjoyed all of the interactive features. This course kept me engaged and prepared me for emergencies as well as teaching this course. The only thing I would change would be for the course to allow me to work at a faster pace if I understand the material. Overall very satisfied with the course. Rated 1 out of 5 by EE1990 from Misleading Class Title I searched for a CPR class due to needing a certification. When I searched for the CPR class I needed, it asked me to input by zip code to help me find a class nearby. After doing so, it lead me to the online classes. The first one that popped up is the adult first aid/CPR/AED. I thought to myself, "hey cool. For $30 I can renew my CPR." Wrong. This class states in the description that it will provide you a certificate after completion. It does not. The scenarios are nothing like the previous CPR certifications I have taken. I fear that I have now spent $30 dollars and will not be able to use this towards what I needed. I have emailed the certification department at American Red Cross. Hopefully I will hear something from them soon. Rated 5 out of 5 by Gforce76 from Best way for ME to learn The interactive CPR/AED course played out like a video game that kept me engaged and I walked away holding onto the information better than in the group learning setting. It is so easy to go back over “missions” that you felt you could do better at/learn the lesson clearly. Excellent!